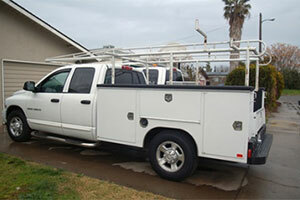 "In the Winter of 2010, I got a call from the owner of our company telling me to go pick up Crummy, our company truck. Dave, one of the guys on my crew, had parked the company truck at his house when he left for his two-week elk hunting trip. I drove my personal truck with a buddy over to Dave's house to get the company truck and had my buddy follow me back home. Well, two weeks later, when I got to work on Monday, Dave called the office. He was back home and wanted his truck brought back over to his house. He wanted me to shuttle the company truck back over for him. This caused a huge confrontation, HIS truck, me being his personal shuttle driver, etc., etc. This argument resulted in a seven year grudge! After learning about the "grudge bag" in Session 5 of the LDL, I did some sober soul searching. This week, seven years later, I decided it was time to end the feud. Who knows what the tension had cost us both in heartburn and headaches. I wasn't quite sure how to approach Dave. I thought about it for a while and decided to just go say I was sorry for the misunderstanding about the truck and shake his hand (even though I wasn't sure I was in the wrong). Once I said I was sorry, I saw a light in his eyes and a bright smile that I hadn't seen in a long time. Dave has been a lot more pleasant to work around ever since. I feel like a load has been lifted off my back. "The lesson I learned from this experience is in a heated situation, to walk away and think about it before I react. If and when things get blown out of proportion, be the first to apologize, even if it is not all my fault. "The benefit you will gain is more self-respect and you will earn the respect of others. You will create a positive work space and you will experience improved performance by all your crew members." If you want to create an engaged, even turbocharged, team find ways to be crystal clear in all your communication, be sure expectations are clearly understood and agreed to. When people misunderstand, clarify, when people violate your standard, remember to be respectful as you ask that they commit to living up to the standards of excellence we all want to enjoy. 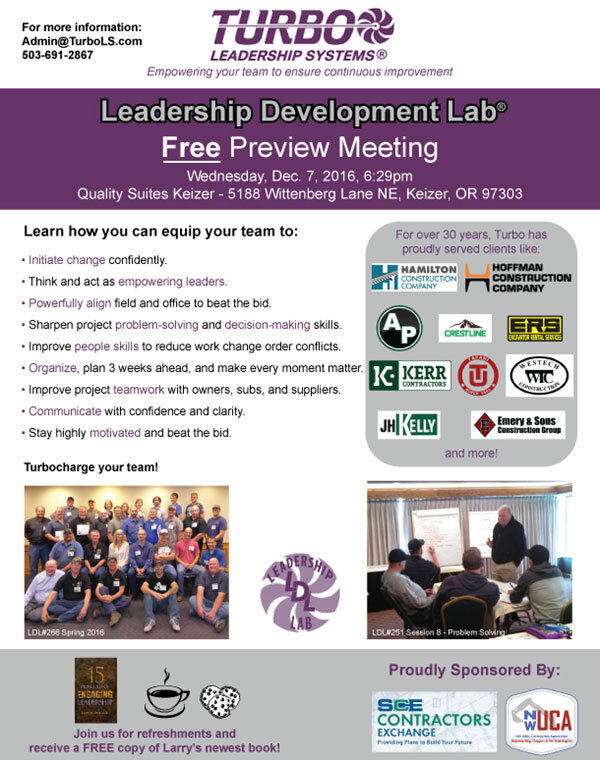 Please Join Us for a FREE Preview Meeting for Leadership Development Lab in Wilsonville! Thursday, April 20th we will be holding a FREE Preview Session for the Portland Metro area at the Holiday Inn Portland South in Wilsonville at 6:29pm. 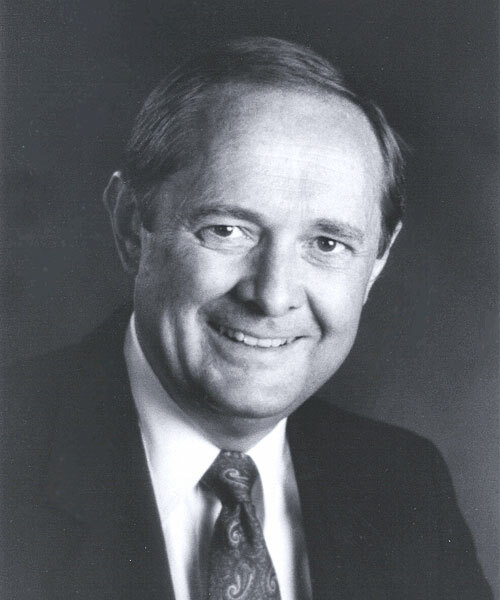 The Leadership Development Lab (LDL) dramatically enhances your leadership team's ability to give supportive feedback, build trust, gain respect, sell ideas, and empower others for improved results. 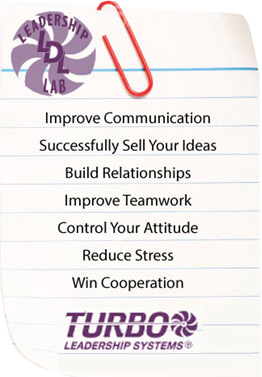 Turbo Leadership Systems® approach maximizes participation and minimizes interruption to work. Your managers make the biggest investment, the investment of their time. We make every moment matter, ensuring the time invested pays back dividends quickly and are sustained. Class size is limited, so please call 503-691-2867 or email Admin@TurboLS.com to register your team as soon as possible!